Here's a superb new online slots UK game from Eyecon gaming. 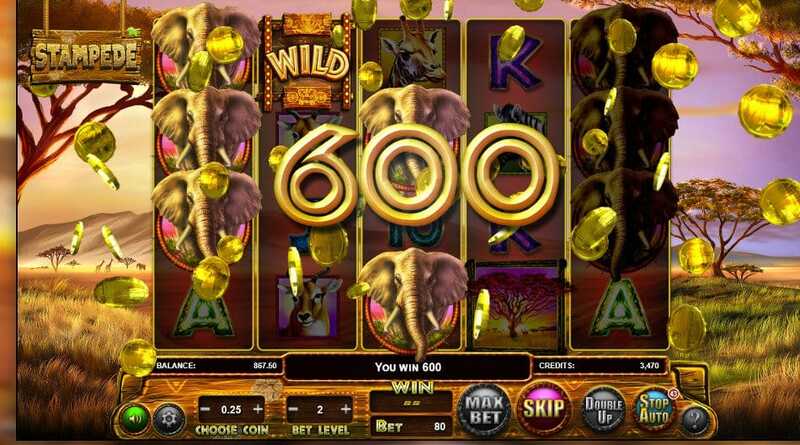 There’s a rumbling sensation approaching across the African plains, and it’s the sound of Stampede’s reels thundering onto the online slots scene. The wide-open spaces of the Savannah are filled with mystique and powerful natural beauty that has long captivated the indigenous populations, travelers, and tourists. These expansive lands have been the backdrop to some incredibly moving fictional stories, such as Disney’s ‘The Lion King’ (can’t you just hear the opening strains of those first few bars of that lavish musical, and visualise the blood-red sun creeping over the horizon, as a wise old monkey holds up a baby lion, destined from birth to be King?). The Savannah is also home to some of the world’s most fearsome and beautiful animals, and Stampede’s drawing power is in part down to harnessing the universal fascination for these enormous, venerable creatures. This slots games will transport you into the dry heat of one of the globe’s most impressive landscape, and entertain you not only with the flora and fauna but also with plentiful winning opportunities. So, pull on your walking boots, khaki top and trousers and grab your ‘Wild Thornberrys’ style explorer’s hat, because we’re heading on a slots safari. Their games are invariably uncluttered and accessible in feel, with function taking equal billing to style in their design. A great benefit of this is a streamlined gaming experience for those who are new to the ‘bells and whistles’ that can accompany online slots games and might feel intimidated or distracted by excessive detail. Eyecon’s speciality is delivering authentic-feeling, satisfying, old-school slots content, in which features and bonuses drive the game without intruding on the basic satisfaction of winning. It doesn’t hurt, either, that their games are typically visually stunning and sensually immersive. If you love promo's, don't forget to check out SlotsBaby. Stampede features a striking background that might be a strong contender in a nature photography contest. It’s a photo-realistic image of a dry plain in the Savannah, just as sunset turns the entire vista a glorious golden-orange. The five reels feature a select but vibrant assortment of symbols, many of which are inspired by majestic African beasts. There’s a lion, a rhino, a cheetah, and a wildebeest, alongside brightly-coloured J, Q, K, A and number symbols on a background of what might be cracked earth, or a close-up of elephant skin. Lions are the most lucrative, as you might well expect, from the King of the Jungle (a strange title, indeed, for a creature that inhabits the African plains). The artwork is incredibly detailed, providing a sense of realism that helps place you right in the centre of the game’s world. Indeed, it’s difficult to tell if the pictures in the symbols are photographs or hand-drawn. 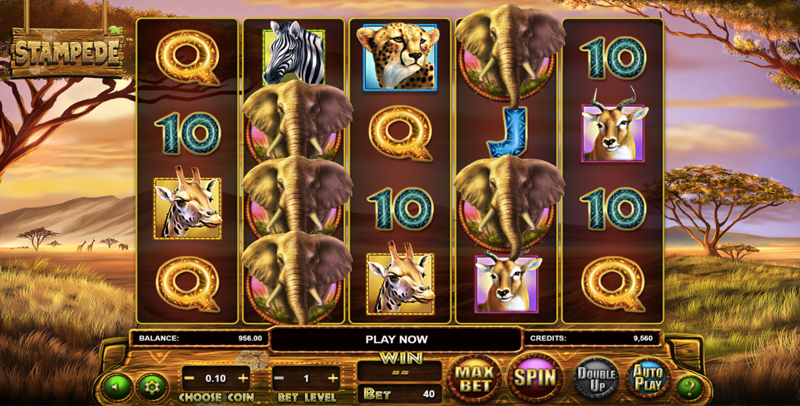 SCATTERS – 3 or more scattered Elephant symbols will trigger a Free Games Bonus. The game offers an interesting spin on this common feature, however, by adding a customisable element. According to your preference, you can choose to receive 20 free spins with wins multiplied by 2, 15 free spins with wins multiplied by 3, 10 free spins with wins multiplied by 4, 8 free spins with 5x multiplied wins, or 5 free spins with a 10x win multiplier. This gives the player a unique kind of control over their free spins, and far more power over the shape of their game. WILDS – the striking, orange Sun symbol, which appears on reels 2, 3 and 4, substitutes for any other symbol apart from an Elephant SCATTER. AUTOPLAY – this feature allows you to play without having to press the ‘spin’ button. It provides four options, allowing you to set 10, 20, 50 or 100 automatic spins, The handy ‘loss limit’ feature lets players set a limit for losses in an Autoplay session, which is a great boon for cautious players, or those on a budget. The sound effects add perfectly to the atmosphere of Stampede. Elephant SCATTERS are punctuated with a thumping tone, and wins release a short burst of music that conveys the sense of traditional African song. There is no background music, which focuses you in on the gameplay and makes sound effects stand out with great impact. The layout of this slots game is clean and clear, making gameplay simple and effortless. Your credit, bet and wins are displayed prominently at the top of the screen, and function buttons at the bottom. In keeping with the tried-and-tested Eyecon format, there’s a handy button for information on paylines, bonuses and rules, and another for adjusting your bet, or setting it automatically to maximum. Though the Savannah is vast, there’s no chance of you getting lost with Eyecon as safari leaders. Whether you’ve earned your zebra stripes as a seasoned slots explorer, or are taking your first tentative steps into this large, fascinating landscape, you’ll find Stampede a treat for the senses, and a thrill for the adventurer in you. You’ll be richer for the immersive sensual experience of the Savannah plains, and hopefully a little richer in other ways, too, if the bonuses have herded up some wild wins. If you enjoyed Stampede then you might also like Fluffy Fairground.